Juan Mart�n is an outstanding flamenco guitar player and composer! 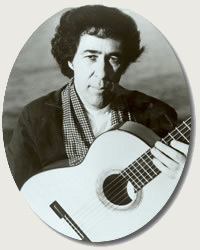 He is among the very small number of flamenco guitarists to achieve international recognition as a solo concert and recording artist. From his origins in M�laga in Andalucia (Spain), his art has evolved in the purest Spanish traditions of flamenco. He is also passionately committed to communicating the mysteries of this great tradition to others, as shown by his method books, transcription books, and DVDs. His early influences were Ni�o Ricardo and later Paco De Lucia in Madrid. The �100 notes per second brigade' however doesn't interest him musically and he is more likely to draw inspiration from Claude Debussy, Maurice Ravel, and Manuel De Falla. In this sense Juan Mart�n is a guitarist-composer of contemporary music while respecting the great flamenco tradition. His guitar method �La Guitarra Flamenco� is regarded as the �Bible of Flamenco� worldwide and within his lifetime is at least as well known as Fernando Sor�s classical guitar method. It is no wonder that Jos� Manuel Gamboa, the most eminent Spanish flamenco writer and critic, wrote �he has an impeccable technique and is an authentic ambassador of flamenco music throughout the entire world." Juan Mart�n was voted two years running as one of the top three flamenco guitarists in the world in �Guitar Player Magazine�. Pyrotechnics can be produced by some players, but instinctive musicianship is a rare quality. �No flash, just loads of panache� - The Melbourne Age. His compositional ability in presenting the traditional forms of this fascinating art has led music critics to compare him to Joaquin Turina, Francesco T�rrega, and Isaac Albeniz. This DVD lesson provides 42 solos, progressively graded in 6 grades from 0 to 5, to suit players at any stage from beginner to intermediate and more advanced. It contains examples of 18 different palos (rhythmic forms) of flamenco, with a wealth of melodic falsetas and rhythms. The music for all these is accurately written in notation and tab in this book and is also recorded on the accompanying CD. Contents include: "Solea" (6 Soleas at varying levels of difficulty), "Tientos, Sevillana, Verdiales, Alegrias En Mi, Fandango de Alosno, Rumba, Tangos, Carcelero, Farruca, Alegrias en La, Zorongo, Cantinas, Seguiriya, Fandango de Huelva, Bulerias Por Arriba, Malaguena, Granadinas, Zapateado, Solea por Bulerias, Tarantas, Verdiales, Guajiras". This DVD lesson by Juan Martin provides 21 solos progressively graded in the three higher grades, 6 to 8, to suit players at intermediate and more advanced stages who already have some experience with the instrument and the techniques of flamenco guitar. In addition it contains 4 extra recorded tracks and 2 more complete concert solos. Besides further examples of 9 of the 18 palos (rhythmic forms) played in Volume 1, it contains examples of 7 further palos to make a total of 25 for the series. Juan Martin superbly demonstrates how the art of flamenco soloing develops from simple beginnings to the level of concert solos which draw on classic falsetas and his own original compositions from his albums. Contents include: "La Cana, Farruca, Columbianas, 2 Sevillanas, Bulerias de Sabicas, Granadinas, Garrotin, Solea, Seguiriya y Cabales, Bulerias de Paco, Tarantas, Milonga del Recuerdo, Tangos Flamencos, Zambra Mora, Solea de Ricardo, 3 Sevillanas, Solea por Medio, Rondena, Rumba Nostalgica, Serranas de Ricardo, Bulerias, Garrotin de Sabicas, Bulerias (Ritmo y Falsetas), Rumba". This first book of a projected 3 volume series by Juan Martin is designed for the complete beginner and requires no prior knowledge of the guitar or flamenco music! It also provides invaluable insight and material for more advanced players who want to capture the essential techniques, sounds, rhythms and emotional power of authentic flamenco guitar. The series begins with in-depth demonstrations of how the basic building blocks of flamenco guitar technique are used in actual flamenco music. The material then progresses to a detailed exploration of the individual rhythmic forms - the palos. In this book, the fundamental palos of Solea and Alegrias are presented to emphasize the basic rhythms and provide examples of falsetas - the melodic passages that build flamenco guitar solos. Juan then shows how to apply these when collaborating with a dancer and a singer. The two DVDs contain over 3.5 hours of explanation and demonstrations. The first DVD provides a detailed introduction to basic flamenco guitar techniques by using examples of authentic flamenco solos to show these techniques in action. The second DVD progresses to demonstrations of the Solea and Alegrias including music for the solo guitarist as well as the guitarist accompanying the dancer and singer! The acclaimed first volume of this exciting series gave extensive insights into basic techniques of flamenco guitar playing and the two important rhythmic forms (palos) of Solea and Alegrias. This second volume continues on with an exploration of further essential rhythmic palos. The first of these, occupying the entire first DVD, is the Bulerias. Juan Martin brings his many years of experience as an internationally renowned flamenco soloist and accompanist for singers and dancers to unravel its mysteries, explaining and demonstrating very clearly the different elements of its rhythmic structure and the various ways it may be accented and counted. He uses traditional and more modern examples of the different kinds of rhythm and melodic passages (falsetas) to provide an invaluable understanding of this wonderful palo. The second DVD is devoted to the popular flamenco Rumba, then Tangos, Tientos and that most profound of all the palos, the deeply moving Seguiriyas. Juan's solo playing is complemented by demonstrations of the guitar's role in accompanying the flamenco dance (baile) and song (cante) with the help of outstanding dancers Raquel de Luna and Miguel Infante and singers Amparo Heredia and Carlos Brias. The two DVDs contain 3 hours of explanation and demonstrations! Juan Martin Plays "Rumba Nostalgica & La Feria"
In this world famous course, flamenco guitarist Juan Martin explains, teaches and demonstrates all of the essential guitar techniques (picado, rasqueados, tremolos, arpeggios, scales, slurs etc.) and rhythmic forms of authentic flamenco guitar playing in 6 progressive lessons designed for all players from beginner to advanced! The lessons show you in great detail many varieties of the basic rhythms which form the foundation of flamenco guitar styles. They also give you a wealth of traditional and modern flamenco guitar falsetas - all presented in a series of 6 very in-depth lessons on 2 instructional DVDs. In this way you not only learn how to play but also what to play, as the lessons build into a substantial repertoire of authentic flamenco guitar pieces! Performances include: "Viva Los Novios (Alboreas), Amante, La Fronter (Bulerias), Ritmo Manantial (Fandangos), Cana Raja (Guaijiras), Ritmeo y Taconeo (Intro & Alegrias), La Pelea, La Fragua (Martinetes), Los tres Musicos (Ronderia), Rumba Nostalgica, Baile de los Bastones (Seguiriyas), Sevila (Sevianas), Impetuosos (Solea por Medio), Esencia (Solea), La Pasion del Lamento (Tangos), Bordon Minero (Tarantas).